Something genuinely new from the author of historical novels about the black American experience (Gabriel’s Story, 2001; Walk Through Darkness, 2002) and the Second Punic War (Pride of Carthage, 2005). 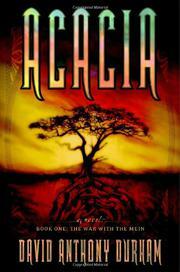 Volume One of a planned trilogy, it’s set in a fictional empire, the Known World, whose political center is the fertile and temperate island realm of Acacia, ruled by King Leodan Akaran. He’s a compassionate monarch who sincerely mourns his beloved wife and dotes on his four vibrant children: stalwart Aliver, his ingenuous brother Dariel and their sisters, headstrong Corinn and stoical Mena. Yet Leodan has inherited his wealth and power from “a slaving empire…[that] traded in flesh…[and] peddled drugs to suppress the masses.” Opposition to Leodan’s ostensibly benign reign appears at the outset, as Thasren Mein, one of three brothers who effectively rule a distant (and impoverished) northern wasteland, travels in disguise to Acacia to assassinate his people’s longtime enemy. From every corner of the Known World, tribes and enclaves ally themselves with Akarans or Mein, and gradually assemble into battle positions. Meanwhile, a plan conceived long ago by Leodan and now orchestrated by his Chancellor Thaddeus Clegg (one of several characters possessed of divided loyalties) sends the royal children away, into separate adventures and ordeals: Mena among a remote island culture’s sinister priesthood; Dariel as a warrior member of Rebellious Outer Island Raiders; Corinn as the mistress of Machiavellian Mein Chieftain Hanish; and Aliver as the hero he was bred to become, challenged to defend his people in single combat. The novel’s strong echoes of Homer and Virgil, Tolkien, Norse mythology’s Twilight of the Gods and America’s compromised history as a republic built on slavery fuse into an enthralling, literate and increasingly suspenseful narrative. Heavy going, but Durham has imagined its landscape and ethnography in persuasive detail. Many readers will eagerly await the continuation of Acacia’s story.